Features fishing tackle making molds, tools and accessories. Includes instructions and customer photographs. Offers custom molds and a line of stock molds. Bait control that aims sinker down. Manufactures the Elberta Cliper fixed slider and sinker release. Offers a variety of molds. Includes discussion groups, links, and a classroom. Offers ceramic plaster molds. Highly detailed, hand-sculpted pieces. Stained glass full circle lamp making molds with matching kiln ready slumping molds for lamp artists. Makes and sells silicone molds. Offering a variety of molds for the hobbyist and the professional. Do-it Molds offers fishing tackle making products. Offers a selection of ceramic molds. Quality aluminum molds for soft plastics. Offers a full line of decoy molds. Specializing in the molds and the materials to make them. Selections include wax, wicks, scents, molds, as well as soap molds, bases and colors. Instructions available. Ceramic molds by Alberta, Jasper, D and R and Jay-Kay. Manufacturer of unique ceramic plaster molds that are highly detailed, hand sculpted unique pieces. Plaster bandage material and kits for sculptured body molds, pregnancy belly masks and face molds. Offers hand poured candles and soaps. Also manufactures silicone candle and soap molds. Source for concrete molds used to create stepping stones, benches, birdbaths, utility items, and many other garden items. Offers a variety of flexible silicone and polyurethane candle molds. Scented handpoured candles also available. Sells a variety of silicone molds for soap and candle making. The foam walker is a slip sinker used to decrease snagging and is excellant for drop shotting. The Ice Buster Bobber is the new finesse ice fishing bobber. Offers handcrafted silicone candle and soap molds, candle snuffers, and candle climbers, as well as flameless candles and beeswax wall hangers. Manufacturer of metal candle molds. Offering original doll molds that range in size from 1 1/2 inches to 6 inches tall, including fairies, fantasy, Mr. and Mrs. Santa, wigs and prewaved hair, and wings. Premo, Pearlex powders, eraser clay, stamplets, dental tools, sculpting tables, tools, molds, hinged mint tins, jewelry findings, molds, miniature cookie cutters, Weldbond glue, and acrylic rods. Designer, manufacturer, and seller of designer molds. Features wax, fragrances, wicks, glassware and molds. Offers an assortment of molds and accessories. Offers products for the home, decor, and gifts. Reusable molds for large ice displays, available for rent or purchase. Offers an extensive selection of molds for ceramic bisque. If the business hours of Hilts Molds in may vary on holidays like Valentine’s Day, Washington’s Birthday, St. Patrick’s Day, Easter, Easter eve and Mother’s day. We display standard opening hours and price ranges in our profile site. We recommend to check out hiltsmolds.com/ for further information. 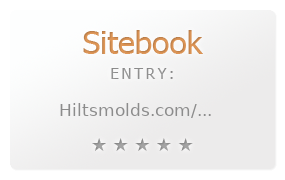 You can also search for Alternatives for hiltsmolds.com/ on our Review Site Sitebook.org All trademarks are the property of their respective owners. If we should delete this entry, please send us a short E-Mail.